As per the latest SEMI reports, North America-based manufacturers of semiconductor equipment posted $1.27 billion in orders worldwide in July 2013 (three-month average basis) and a book-to-bill ratio of 1.00. 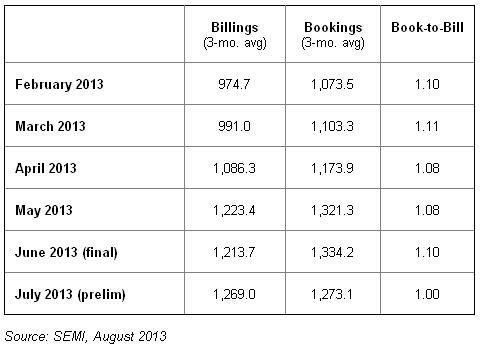 The three-month average of worldwide bookings in July 2013 was $1.27 billion. The bookings figure is 4.6 percent lower than the final June 2013 level of $1.33 billion, and is 3.1 percent higher than the July 2012 order level of $1.23 billion, according to SEMI. The three-month average of worldwide billings in July 2013 was $1.27 billion. The billings figure is 4.6 percent higher than the final June 2013 level of $1.21 billion, and is 12.0 percent lower than the July 2012 billings level of $1.44 billion, as per SEMI. "Billings for new semiconductor manufacturing equipment continue to increase and the ratio has been at or above parity for the past seven months,” said Denny McGuirk, president and CEO of SEMI. "However, order data moderated slightly in the July report and we will look to the month ahead to determine if this reflects a trend change."